Perfect for minor cuts, scratches, and scrapes. Almost all plants are reported to have healing properties of some sort, some more powerful than others. A fair number of plants also have constituents that are antibacterial, anti-fungal, anti-parasitic, or anti-inflammatory. Some plants have several, or even all of these properties. The salve we offer makes use of these natural properties to provide a protective layer that will help keep out unwanted bacteria as well as aid in soothing the skin and complementing the natural healing process. And an added bonus … herbs don’t create resistant bacteria strains! 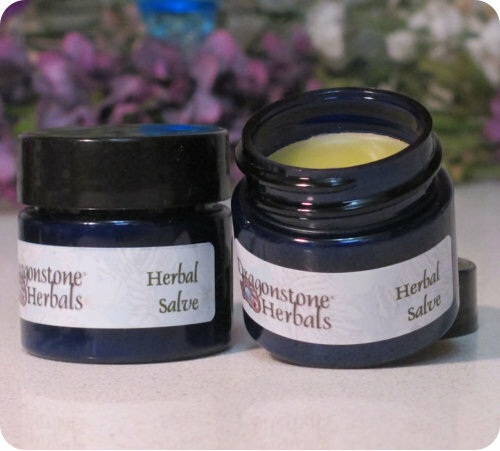 The herbs used in our salve have traditionally been used for scratches, scrapes, rashes, and other minor skin wounds by reducing the chance of infection. 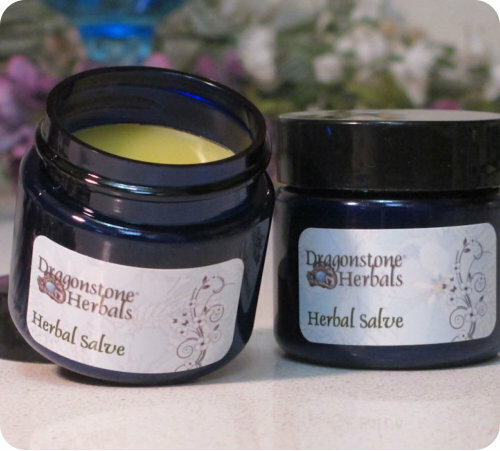 The salve can be reapplied as needed and may be used with a bandage if desired. It is strongly recommended that the wound be washed prior to reapplying the salve. It’s safe for children and pets too! About the herbs: Goldenseal Root, Myrrh Gum, Usnea and Tea Tree Oil are high in antibacterial properties and work to help prevent infection; Echinacea and St. John’s Wort help to speed healing and assist with cell regeneration; Acacia Gum and Poplar Buds form a gum-like substance that creates a protective seal over the wound. Olive oil and beeswax are used for the base in this salve. Our salve is available in 2 ounce plastic jars (not shown), 1 ounce plastic jars (shown above), and 1/2 ounce plastic jars (shown left) that are perfect to toss in a bag or purse. Store in a cool, dark place. Warnings/Precautions: For external use only, do not ingest. Do not use if allergic to any of the ingredients. Discontinue use if irritation or redness occurs. Almost all plants are reported to have healing properties of some sort, some more powerful than others. A fair number of plants also have constituents that are antibacterial, anti-fungal, anti-parasitic, or anti- inflammatory. Some plants have several, or even all of these properties. The salve we offer makes use of these natural properties to provide a protective layer that will help keep out unwanted bacteria as well as aid in soothing the skin and complementing the natural healing process. And an added bonus … herbs don’t create resistant bacteria strains! The herbs used in our salve have traditionally been used for scratches, scrapes, rashes, and other minor skin wounds by reducing the chance of infection. The salve can be reapplied as needed and may be used with a bandage if desired. It is strongly recommended that the wound be washed prior to reapplying the salve. It’s safe for children and pets too! About the herbs: Goldenseal Root, Myrrh Gum, Usnea and Tea Tree Oil are high in antibacterial properties and work to help prevent infection; Echinacea and St. John’s Wort help to speed healing and assist with cell regeneration; Acacia Gum and Poplar Buds form a gum-like substance that creates a protective seal over the wound. 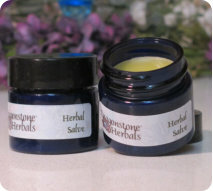 Olive oil and beeswax are used for the base in this salve. Our salve is available in 2 ounce plastic jars (not shown), 1 ounce plastic jars (shown above), and 1/2 ounce plastic jars (shown left) that are perfect to toss in a bag or purse. Store in a cool, dark place. Warnings/Precautions: For external use only, do not ingest. Do not use if allergic to any of the ingredients. Discontinue use if irritation or redness occurs.